The next time you’re in the shower, dedicate a few minutes to your inner thoughts, and let insightful new ideas wash over you, while this powerful moisturizing mask deeply soaks your hair. This heavenly mask is enriched with pure therapeutic herbal extracts, such as Moroccan argan oil, French borage oil, sea buckthorn, jojoba, mandarin, and apricot, which promote intensive nourishment, smoothing, and restoration of dry, damaged hair. 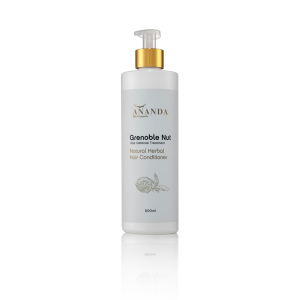 Its premium formula also features green tea and aloe vera extracts, to calm a dry, itchy scalp. To best protect your hair’s natural moisture, our revolutionary Natural Moisturizing Hair Mask is based on organic shea butter, Moroccan argan oil, silk proteins, hyaluronic acid, and French Grenoble nut extract. Now all that’s left for you to do is close your eyes, rinse away all the stresses of yesterday, and let your body enter a state of complete relaxation. Shlomit adds: This lavish hair mask, like all our products, does not contain salts, parabens, BHT, SLS, metals, or any other harmful ingredients, making this the cleanest, most natural product for your hair.